IK Aivazovsky, depicting the sea element, was not just a talented artist, but a singer of an extraordinary marine nature. One of his paintings called “The Seascape” and beckons to him with an incomprehensible power. In the center of the canvas is an endless sea space, smoothly passing into the sky. Gently-blue tones gradually become a haze of siren, behind which you can see the contours of the majestic mountains. Waves seem to gradually run in, preparing to crash onto any vessel that accidentally falls into an angry sea storm. Despite the excitement of the sea, nature seems peaceful and calm. It is impossible not to pay attention to the sailboat, a bright spot standing out on the watery surface. Here as it is impossible by the way come to mind Lermontov’s lines about a lonely sail, wandering around the sea. The ship seemed to be lost in the sea depths, and the waves ruthlessly clatter along its sides. But somewhere there in the azure distance, where the sea converges with the sky and even the sunshine is visible, there is a hope for the ship that the sea will not swallow it in its bottomless depths. And the sailer, in proud solitude, will calmly reach the shore. What power of colors is used by Aivazovsky to convey the changeable mood of the sea! Powerful waves in their crystal blue get the blue-black shade, where for ships there is a terrible threat to be beaten against the rocks. Still, storms do not have to wait, because on the horizon there are already clearings. Such a richness of colors, which showed the beauty of the sea landscape, makes the viewer feel that every detail of the picture is a separate life that forms an inseparable element of the overall composition. IK Aivazovsky helps us to feel and appreciate the beauty of the sea in all their changeable nature. 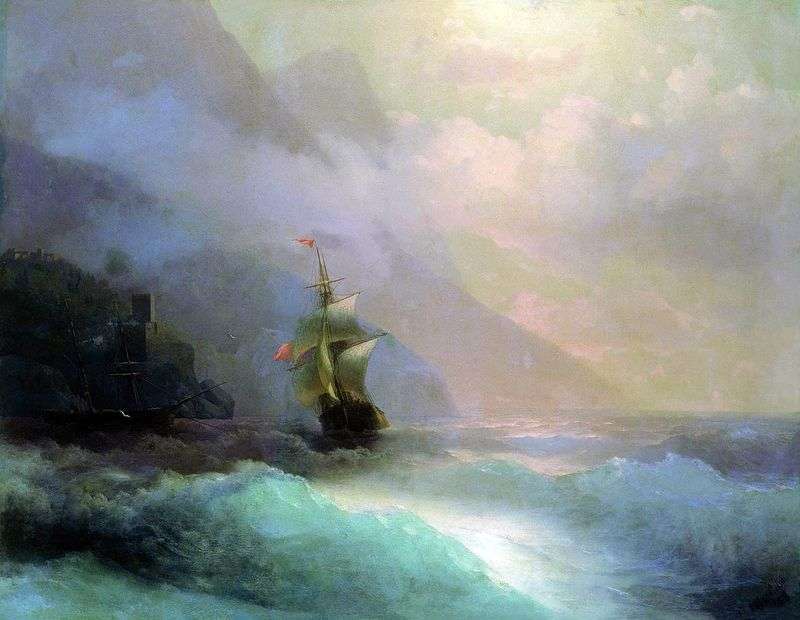 Description and meaning of the painting Seascape by Ivan Aivazovsky.